We were treated to a superb illustrated talk on Titus Salt and Saltaire by local historian Dave Shaw after their October 3rd lunch. 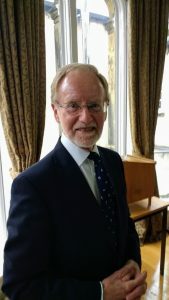 He focused on a few little-known facts – the first that Titus Salt and his son were not in fact responsible for all of what we today think of as Saltaire – and encompassed in the World Heritage site. There were in fact three different phases of development, Sir James Robert (Roberts park bears his name) added to it considerably in the early twentieth century, but his buildings blend in so successfully, most people assume they are of the same date as the main mill. 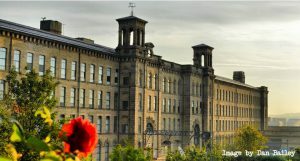 Another surprising fact is that the single story building opposite the main mill entrance, now owned by Saltaire College has a ground floor 20 feet beneath the level of the road. It was built as a canteen, though it has seen many different uses in its long history and was originally accessed by workers via a tunnel under the road. The road needed to go over the already existing railway –so the approaches were steeply banked up and the access tunnel cut through. A second concrete floor was inserted later, but this collapsed shortly after, killing one worker. Given that the dining room was built to accommodate 500, it was fortunate the collapse took place in the evening. Much of this history has been unearthed relatively recently. We were invited to decide which we considered the most notable building – most would probably plump for the gigantic mill, but the Church is in fact the only Grade 1 listed building (the others are Grade 11), but our speaker nominated this building as the most interesting. An image of a young Winston Churchill was another surprise. He was invited and accepted, for the duration of one year 1917-1918 whilst he was Minister of Munitions, to be President of the village school where there was a tradition of eminent Presidents. Churchill was not recorded as visiting the village, but many eminent people did. 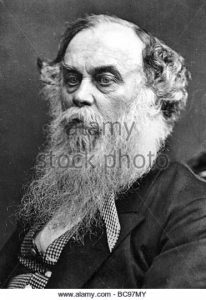 Ramsay McDonald was refused as a speaker during the war, but came later. Jim Laker the famous cricketer played for the village team – presumably before he was a Yorkshire and England international cricketer! He still holds the record for taking the most wickets in a test. In the 1956 series at Old Trafford he took 19 Australian wickets. The most surprising fact perhaps is that Saltaire was not the only settlement built by the Salt family. Titus had come into possession of land in Dayton, Tennessee and Titus’s son decided to develop the coal and iron potential of the site, due to the proximity of the Chattanooga to Cincinnati railway line. However it was not a successful venture and not only did that fail, but it led to the end of the Salt involvement in the Saltaire woollen mill. A teapot in the Salt Archives at the Mill witnesses this episode in the Salt story! Titus’s sons were perhaps more inclined to farming – model farms were developed at Milner Field and Ferniehurst.